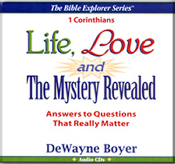 DeWayne Boyer: Explore 1 Corinthians (Verse by Verse) Bible Study: . Never a dull moment -- the Apostle Paul deals with issues as contemporary as tomorrow: issues, disagreements and division in the church, Christians willing to sacrifice love for one another on the altar of their own selfish erroneous agenda. Sound like the church today? You will be amazed how directly God's answers to the dilemmas in Corinth apply both to the church and our personal lives two millenia later. Explore 1 Corinthians with this heartwarming series and discover how Paul finds God's quintessential gift of Christ relevant in the real life issues of people struggling to understand His claim on them. DeWayne Boyermakes the Bible come alive, showing how the Written Word points to the Living Word, in Whom alone is salvation. His graduate work at Andrews University and Princeton Theological Seminary centered in New Testament studies, especially Pauline Theology. DeWayne's candid teaching style is refreshing and practical. Best of all, the Living Word is clearly revealed.